The original Annotated Sherlock Holmes (1972) edited and annotated by William S. Baring-Gould. The stories are arranged in what Baring-Gould reconstructed as chronological in Sherlock Holmes's life. The New Annotated Sherlock Holmes (2005) edited and annotated by Leslie S. Klinger. 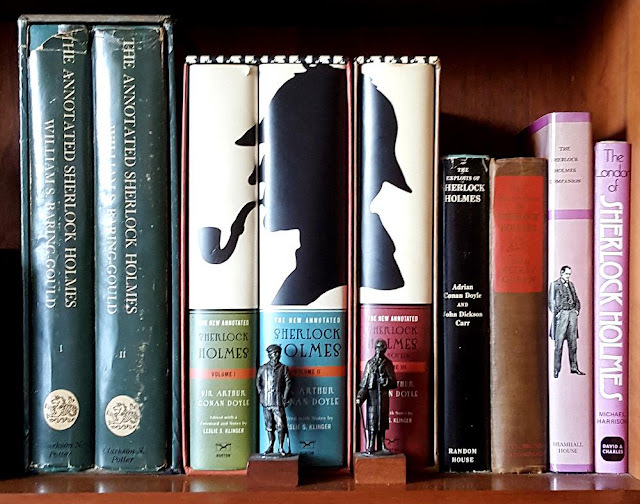 One volume is devoted to Conan Doyle's Holmes novels and two others to the short stories. The Exploits of Sherlock Holmes(1954), a collection of Holmes short stories written by Arthur Conan Doyle's son Adrian Conan Doyle and John Dickson Carr, himself a well-known Golden Age author of detective novels. I remember borrowing the book from the library while I was still in elementary school and then ordering a copy for myself. The Misadventures of Sherlock Holmes (1944), edited by Ellery Queen. This one is fairly rare because the Conan Doyle estate brought suit alleging, I think, that it violated their copyright. There was only one edition. It is a collection of Holmes stories written by many authors including Agatha Christie, Ellery Queen, Mark Twain, O. Henry, August Derleth (a Wisconsin author), Frederic Dorr Steele (a Holmes illustrator), etc. Some stories are serious, others intended to be humorous. The least expensive copy offered at Amazon is around $80.00. The Sherlock Holmes Companion (1962) by Michael and Mollie Hardwick, containing a "Who's Who" of the original Conan Doyle stories, summaries of the plots, a biography of Arthur Conan Doyle, and lots of reproductions of illustrations by the original illustrators (that's true of the annotated versions above, too). This one can be acquired for almost nothing. Finally (on this shelf), The London of Sherlock Holmes (1972) by Michael Harrison with lots of photographs of London in the Holmes era. While I was in graduate school in Virginia one of the local television stations was showing the Basil Rathbone, Nigel Bruce films from the 1930s and '40s. The station offered the little statuettes that stand in front of the books.